The explosion of new types of data in recent years has put tremendous pressure on the financial services data center, both technically and financially, and an architectural shift is underway in which multiple Lines of Business (LOBs) can consolidate their data into a unified data lake. This approach helps financial institutions address risk management and compliance requirements in a cost effective manner. Existing data architectures are siloed within financial institutions IT departments, creating or replicating data marts or warehouses to feed internal lines of business. These data marts are then accessed by custom reporting applications thus replicating/copying data many times over, which leads to massive data management & governance challenges. Please join us for this webinar to learn more on how HPE and Hortonworks deliver a modern data architecture that can both consolidate, and address data security and compliance issues. In this panel webinar, Arun Murthy, co-founder and Chief Product Officer of Hortonworks, helps you navigate hybrid environments and provides best practices to follow for a successful, strategy-based cloud implementation. The world of IoT is exploding uncontrollably across all industry verticals. Hundreds of IoT use cases have come up in the last couple of years. And, if you are in one of those enterprises implementing an IoT solution, have you wondered how to measure the success of your deployment? Have you assessed your readiness across your data strategy, infrastructure setup, people skills or ability to analyze real-time data? Enterprises are increasingly storing and analyzing their data in data lakes that are spread across geographically, as well as in on-premise and cloud environments. This raises the challenge for companies to manage, secure and govern data consistently across distributed environments and at the same time make data available to all the users in the organization. In this session, Matt Aslett, Research Director at 451 Research will lead a discussion with Scott Gnau, CTO at Hortonworks about the challenges and considerations of managing big data on a global scale. GDPR represents a sea change for the organizations that store or process any kind of data on EU residents. As companies scramble to comply with the upcoming regulation, they have questions about how to get started and what are the best practices to follow. In this live panel, you will hear from GDPR experts about the importance of data governance to comply with regulations and get practical advice on how to successfully manage the path to GDPR compliance. Trimble Transportation Enterprise is a leading provider of enterprise software to over 2,000 transportation and logistics companies. They have designed an architecture that leverages Hortonworks Big Data solutions and Machine Learning models to power up multiple Blockchains, which improves operational efficiency, cuts down costs and enables building strategic partnerships. Apache NiFi is an easy to use, powerful, and reliable system to process and distribute data. It provides an end-to-end platform that can collect, curate, analyze, and act on data in real-time, on-premises, or in the cloud with a drag-and-drop visual interface. It’s being used across industries on large amounts of data that had stored in isolation which made collaboration and analysis difficult. Join industry experts from Hortonworks and Attunity as they explain how Apache NiFi and streaming CDC technology provides a distributed, resilient platform for unlocking the value of data in new ways. Learn how you can use Microsoft Azure HDInsight to discover insight from new data sources such as machine logs, sensors, social media, weather and geospatial data. Watch this on-demand webinar and learn how a leading healthcare company is yielding big dividends from Big Data. Advisory Board, a healthcare firm serving 90% of U.S. hospitals, has multiple different business units and data science teams within their organization. In this webinar, they'll share how they use technologies like Hadoop and Spark to address the diverse use cases for these different teams – with a highly flexible and elastic platform leveraging Docker containers. -Migrated their analytics from spreadsheets and RDBMS to a modern architecture using tools such as Hadoop, Spark, H2O, Jupyter, RStudio, and Zeppelin. -Provide the ability to spin up instant clusters for greater agility, with shared and secure access to a treasure trove of data in their HDFS data lake. -Shortened time-to-insights from days to minutes, slashed infrastructure costs by more than 80 percent, and freed up staff to innovate and build new capabilities. Don’t miss watching this case study webinar. Find out how you can improve agility, flexibility, and ROI for your Big Data journey. In today's rapidly changing business environment, organisations face the challenge of adopting and meeting ever-changing stakeholder demands. Business leaders introduce new analytical workloads, expecting IT to deliver services ever quicker and more efficiently to allow businesses to gain real-time insights from the data and drive a more targeted customer interaction - and even fiercer competition. But how can IT make this happen? During this webinar Hortonworks and IBM will share real world use cases, showcasing organisations used our technology to accommodate changing needs and to monetise on the insights gathered from the data. Today's corporate organizations are evolving at a pace that it has become imperative to become data driven, digitally transformed to stay competitive. With this in mind, further advances in new technologies such as open source platforms, artificial Intelligence, virtual reality have challenged those once aspirations now called norms. Join Abhas of Hortonworks as he shares how organizations have evolved transforming their business practices, operations and culture. He'll also share insights into what industries and technologies are trending and what to expect in the not so distant future. Scott Gnau, CTO at Hortonworks and David Loshin, President of Knowledge Integrity Inc.
You have a legacy system that no longer meet the demands of your current data needs, and replacing it isn’t an option. But don’t panic: Modernizing your traditional enterprise data warehouse is easier than you may think. The upcoming GDPR legislation represents a sea change for organisations that store or process data relating to EU residents. With penalties for violations up to 4% of annual global turnover, organisations are scrambling to comply with GDPR provisions. Effective data governance and access control helps enterprises manage risk effectively, comply with regulations and gain competitive advantage through agile decision. Join Srikanth Venkat, Sr. Director Product Management and Ana Gillan, Solutions Engineer as they discuss effective data governance and its role in complying with regulations such as GDPR. They will also cover Atlas and Ranger, the governance and security components of Hortonworks Data Platform and their role in effective data governance. This webinar is not intended to constitute legal advice. Viewers should consult with their own legal counsel regarding compliance with GDPR and other laws and regulations applicable to their particular situation and intended use of any Hortonworks products and services. 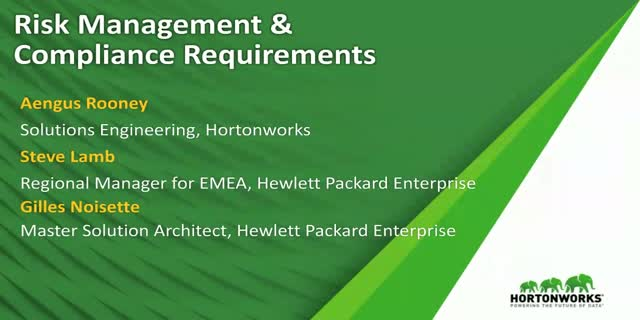 Hortonworks makes no warranties, express, implied, or statutory, as to the information in this webinar. To realize the full potential of modern data applications, organizations need to be able to capture perishable insights from data in motion. While flow management tools are available to help gather, route, filter and transform data from any source, companies have lacked equivalent tools for building the analytics apps needed to extract insight from streaming data. Join this webinar as we discuss how to build next generation analytical application using HDF 3.0 very quickly. Sebastian is an HDF specialist in Europe and has previously worked on Big Data and Software Engineering projects with Raytheon and Lockheed Martin in Australia. He first started using dataflow components such as NiFi three years ago and immediately felt the benefits that it brings and is now the go to data-in-motion evangelist at Hortonworks EMEA. Imagine the power to build a fully functional streaming analytics application without writing a single line of code and within as little as 10min. The march towards autonomous vehicles continues to accelerate. While expert opinion differs on the specific timing and use cases that will emerge first, few deny that self-driving cars are in our future. As we all can appreciate, “teaching” a vehicle to drive under the full range of conditions it will encounter (i.e. road conditions, weather conditions, behavior of other vehicles) is a daunting proposition. If merely the thought of this makes you nervous, you’re not alone – according to the American Automobile Association (AAA), 75 percent of consumers are not yet ready to embrace self-driving cars. However, that is the very challenge facing automakers – teaching vehicles to unfailingly assess and respond to any combination of operational conditions “on-the-fly” through discrete rules (algorithms) governing a vehicle’s behavior. Find out how Hortonworks support subscriptions enable IT agility and success in the cloud. As organisations worldwide develop strategies to gain competitive advantage through Big Data Analytics, the role of the Enterprise Data Warehouse has never been more crucial. The front-runners in the “Big Data Gold Rush” are now leveraging the power of Hadoop to extend and optimise their EDW infrastructure. Hortonworks, in partnership with Syncsort, are helping enterprises to dramatically lower EDW storage and processing costs whilst extending capacity and capabilities. Join us at this live webcast to learn how Hortonwork’s Hadoop Powered EDW (Enterprise Data Warehouse) Optimization Solution with Syncsort DMX-h enables you to liberate data from across the enterprise, quickly create and populate your Big Data lake, and deliver powerful, actionable insights. Customer case studies across a variety of industries will bring to life how organizations are using this solution to gain bigger insights from their enterprise data – securely and cost-effectively – with faster time to value. How does your business navigate the ins and outs of data governance and meet new data security compliance requirements such as the EU General Data Protection Regulation (GDPR)? The GDPR constitutes one of the most comprehensive enhancements of individual data privacy rights and reforms of data protection compliance laws to date. Founded in 2011 by 24 engineers from the original Yahoo! Hadoop team, Hortonworks has amassed more Hadoop experience under one roof than any other organization in the world. Our team works every day to enhance the Hadoop core, creating new code to improve the open product we have stewarded since its inception. Simply put, we are your best choice to support you in your Hadoop journey.